Although we both would have rather been sitting on the front porch reading and/or napping, there was much Spring gardening and yard work to do. Luckily the weather was beyond beautiful which made it much easier to haul our butts outside to get some work done; high was 54 with not a cloud in the sky. Tom has been out of town for a while so this was his first opportunity to get back to the strawberries. 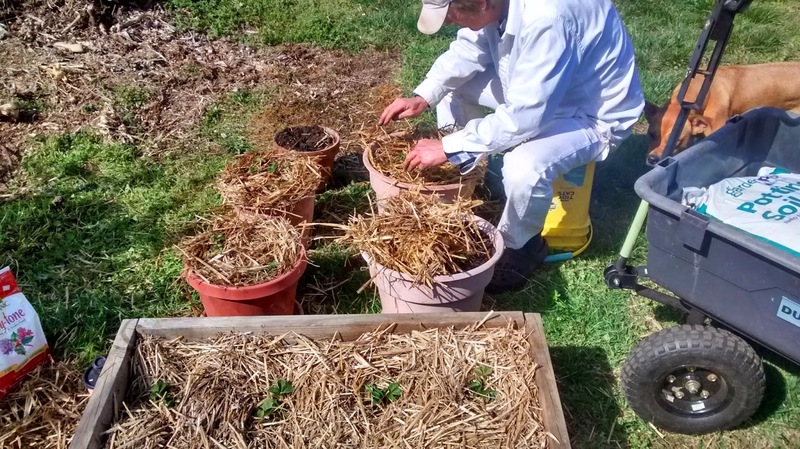 There were 12 plants left over from the first planting so he bought some dirt, filled up several pots, and planted the remaining strawberries. The first round of plants have already started to flower. According to Master Gardener Jerry Baker, we are to pinch off all the berries that form between now and mid-summer. This will ensure a Fall crop this year and two harvests each year thereafter. It's hard to see but in the dead center of this photo you can see a berry starting. Off with it's head! Spring = greens, greens, and more greens which makes TY happy, happy and more happy! 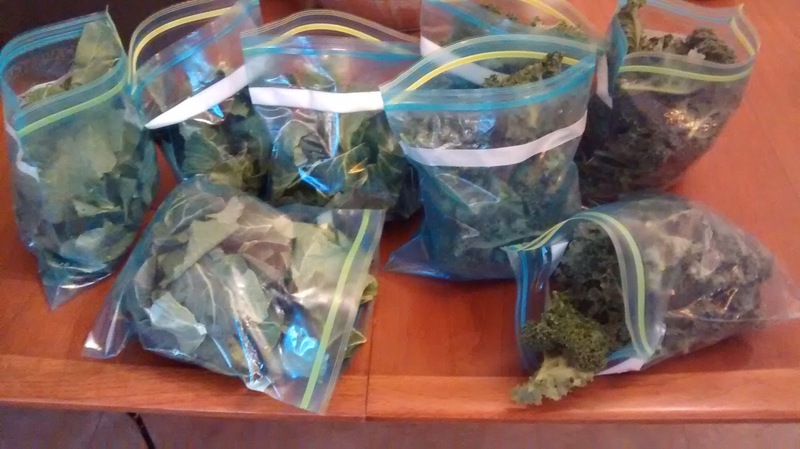 I harvested four bags of kale and four bags of collards. These were from plants that were overwintered, proving that it does pay to plant things in late Fall/early Winter for an early Spring harvest. We had already planted more kale and collards several weeks ago so hopefully we'll get one more round of greens before the heat of the summer hits. What does one do with so many greens? Friday night was kale pesto pasta. Saturday morning we added kale to our breakfast green smoothie. Saturday night it was sauteed collards with grit cakes, tomatoes and eggs. Tonight there's a BIG kale salad waiting for us with some fish on the side. Tomorrow night we'll have sauteed collards with more fish. Tuesday night Tom will make grits and greens. What?! 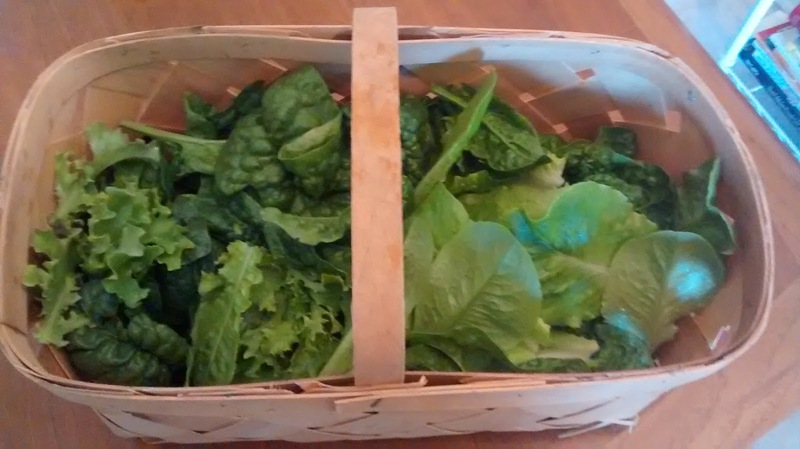 Another batch of greens? Yes, but this is lettuce and spinach. This was also overwintered. Lunch for the week! There was a freeze warning last night (temps dropped into the 20s) which is exactly why we left the hoops up on the bed with growing greens. Tom covered them up for the night and everything survived just fine. All four beds are now fully planted for the Spring. Next up, we'll start summer veg in pots and keep them in the greenhouse until the weather gets nice and hot. We are still here! And we're still gardening! This past year, late Summer, all of Fall, and the first half of Winter turned out to be much busier than usual. So although we did continue gardening, we had to give up the blog posts because of time constraints. But it's a new year with new commitments to our garden, our good food habits, and our blog. Sometimes the amount of things to do in the garden are overwhelming so it helps to have a plan that works with the amount of time you actually have for the day. Otherwise, you can get sidetracked and the things that really need to get done don't. So we had a task list for the day and worked it from top to bottom. Tom's main focus was on berries. We bought strawberry plants (a new addition to TY's Veggie Patch this year) a couple weeks ago and we couldn't wait any longer to get them planted or we'd lose them. Unlike the raspberry, blackberries and blueberries, strawberries wouldn't do too good directly in the ground. Therefore, we decided to take the herb box and make it the strawberry box. The herbs will get a new home (more to come about that in early Summer). Tom got to work cleaning out the herb box. He salvaged some oregano that survived the winter and put those in a separate pot until the new herb bed is ready. 12 plants made it into the box. The rest will be planted in large containers alongside the box. Next up he planted a new blueberry bush. He put it right next to the other two we already had, close to the bee hives. Well, not bad. Looks like things didn't grow much, but they didn't die either so that's gives us a nice start for early Spring, otherwise known as "over-wintering". First job for me was to weed this bed so the lettuce doesn't continue to get choked out. Not too many weeds grew up between the kale and collards so that was an easy job. On to beds 2 & 3. 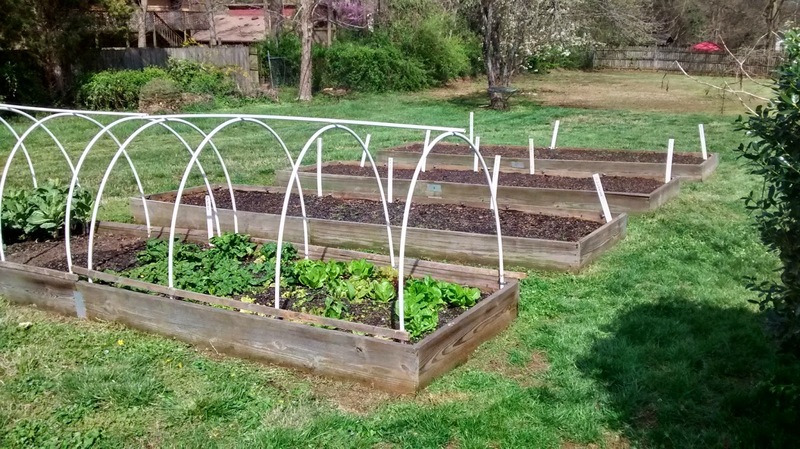 Since half of bed 2 was covered by the hoop house, it had virtually no weeds. Unfortunately, it also didn't have any turnips growing, which is what Tom planted in the fall. Once Tom finished with the berries, he weeded bed 3. We put up markers even though all of this didn't get planted today. That way we made sure to leave space for the rest of the Spring plantings. Today we planted lettuce, collards, kale, Swiss chard, broccoli, and round 1 of cabbage. By the way, is there another kind of chard? If not, why is it not just called "chard"? Anyone? When we bought the strawberries and blueberries, we also purchased a few herb plants. Two kinds of spearmint and one kind of rosemary. Our job with them right now is to keep them warm and watered in the greenhouse until they are ready to go into the #%! *#$ spot next to the back patio where we can't seem to get anything else to grow. Olive and Honey were SOOOO excited to spend the day outside. They are out of practice so they pooped out pretty quick. And, they weren't the only ones.